Virtual reality may not be the novelty it once was, but that doesn’t mean the excitement has died down. At Mobile World Congress in Barcelona, VR products and demos were out in full force. Samsung announced the Gear VR Controller, an optional motion wand for its Gear VR headset, and reportedly showed off an untethered headset behind closed doors. Huawei used 5G wireless technology to deliver not only streaming 360-degree visuals to a headset, but tracked motion in real time. And Nokia showed footage captured by its high-end VR OZO camera. But VR at Mobile World Congress got a little weird, too. Samsung brought insane motion simulators that rotated riders 360 degrees in the air as they watched footage from a Gear VR headset. South Korea’s KT Telecom brought a hamster wheel-like VR contraption featuring a Korean pop star, simulated wind effects, and footage of real-life roller coasters. And a Budapest-based company demoed a brainwave-reading headset that let VR viewers lift objects with their minds. We checked out some of MWC’s wackiest VR experiments. In terms of sheer weirdness, Korea Telecom’s VR demo took the cake. The carrier’s cartoonish showcase mixed skydiving and Korean pop music with the sights and sounds of Seoul, South Korea. But the highlight was the human-sized motorized wheel that rotated viewers (or victims, depending on your perspective) in sync with the footage. It was an intense experience, to say the least. Once strapped into a seat belt and outfitted with a harness, viewers found themselves jumping out of a plane, rushing toward the bottom of a snowy mountain peak, traveling up and down the slopes of a roller coaster, and gliding over the dance floors of South Korean nightclubs. The wheel’s movements made the motion all too real, which appeared to leave some riders more than a little queasy by the end. KT said the goal is to eventually use photographic images, but if a headset alone wasn’t enough to convey the feeling of careening down a ski slope and riding a roller coaster, chances are better graphics wouldn’t do the job. Considering the shaky knees of most attendees afterwards, that’s probably a good thing. MindControl VR isn’t a new virtual reality product, per se, but a merging of two technologies in one: HTC’s computer-tethered Vive headset and Emotiv’s EEG neuron-measuring headwear. Developed by Budapest-based ARWorks, it’s an experience that lets you channel your inner psychic. 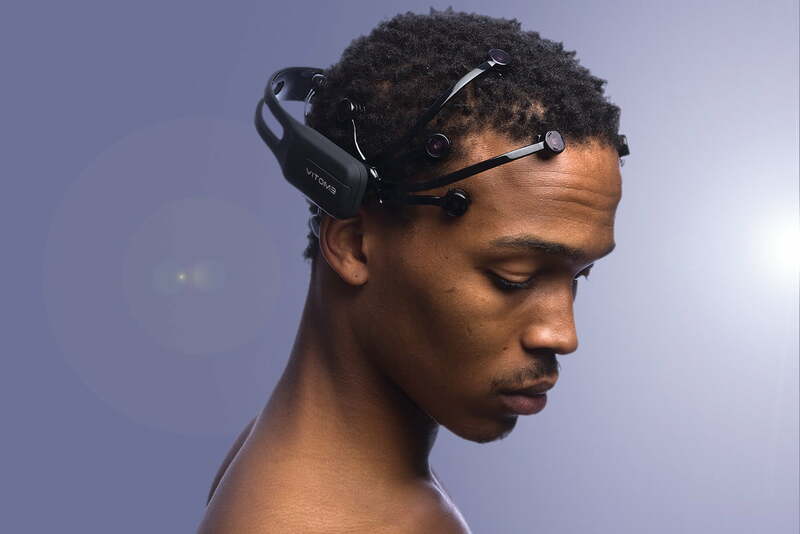 Using software that ran on a computer, signals and patterns from Emotiv’s EEG headset were looped back into the MindControl VR system, which performed preprogrammed actions in the Vive’s virtual environment. Principally, they involved a C-vitamin molecule, a match, and a Rubik’s Cube — all Hungarian inventions, according to the company — and the goal was to use “psychokinetic powers” to manipulate them. After concentrating on the match, for example, it burst into flame, and focusing on the Rubik’s Cube caused it to solve itself. It’s easier said than done. From what we saw, some attendees were able to light the match but had trouble solving the Rubik’s cube, while others weren’t able to manipulate either. “Some people get it the first time, [and] others need a little practice,” CEO Szabolcs Budahazy told Digital Trends. Samsung’s virtual reality experience was by far the largest — and most intense — of the demonstrations we saw. The smartphone maker constructed a gigantic rig full of motion simulators, a motorized dolly, and nearly 100 Gear VR headsets ready to tighten around the faces of eager attendees. The recently unveiled Gyro 4D simulator simulator, a dizzying contraption capable of rotating riders 360 degrees, replicated the motions of a spaceship racing through unfamiliar galaxies. Another simulator sent thrill-seekers on a ride down a skeleton track at the Whistler ski resort in Canada. Other attendees experienced an airshow from a pilot’s perspective. And still others took boat ride down scenic rapids. Huawei’s virtual reality demo brought forth the undead with the help of an HTC Vive and a 5G connection, giving wearers the terrifying experience of withstanding an onslaught of realistic life-size zombies from all directions. A Huawei rep told Digital Trends that the demo was intended to illustrate the potential of 5G technology. Thanks to low latency and high bandwidth, the wireless connection was able to not only deliver streaming 360-degree visuals to the headset, but also track motion in real time. Huawei contrasted that capacity with the networks of today, which by and large max out at the comparatively low resolutions of Google’s Daydream or Samsung’s Gear VR.